The second of my three Misadventures of Maggie Mae novellas—You’re Mine, Maggie—releases today, April 15th! I had a clear vision from the start about what I wanted the covers of this series to look like. Finding just the right couple for a book cover is difficult work. When I saw the pictures from the photo shoot Taria Reid did with cover models Angelina Cavanaugh and Jorge Mojica, I knew right away that they were perfect for my Misadventures of Maggie Mae series. Jorge and Angelina captured the undeniable chemistry between my characters Maggie Mae Castro and Clive Poole. I’m lucky enough to have gotten to know Angelina through Facebook and so I asked her some questions about modeling and what it’s like to work with hot guys on nearly a daily basis. Beth: How long have you been a cover model? Angelina: I have been a cover model for about 6 months. Beth: Do you do any other modeling? Angelina: I do a little bit of everything when it comes to modeling—fashion, runway, editorial, pinup etc. I guess I don't want to shut any doors without trying to walk through them first. Beth: That’s very wise of you. You never know what could be your big break. How many covers have you been on? Angelina: I have been on about 50 book covers to date. Beth: You’re so photogenic. How do you prepare for a photo shoot? Angelina: This may sound really weird but I don't exactly prepare for a shoot... LOL. I kind of just wake up and wing it. I do however try not to eat anything fattening or that will make me bloated the night before. I also try to get a good night’s rest. Sometimes shoots go longer than expected so it’s always good to be well rested. Beth: What is your favorite thing about being a cover model? Angelina: I think my favorite thing about being a cover model is all of the people that I get to meet. The models I have met are amazing, the designers and authors I have spoken to, including yourself are lovely, and being a social person...it's very fulfilling. Hey... I'm not going to complain about working with hot dudes all day either and getting to see myself on books. I read a lot so I am very flattered. Beth: I chose the photos of you and Jorge because the two of you seemed to have such great chemistry on camera. How do you school your features/pretend you’re madly in love with the stranger you’re being photographed with? Angelina: Haha its funny you asked that question. We just spend a couple of minutes before the shoot trying to get to know each other and things become very easy. By the time we start taking photos we've gotten to see each other's personalities so it makes it easier to play off of one another. 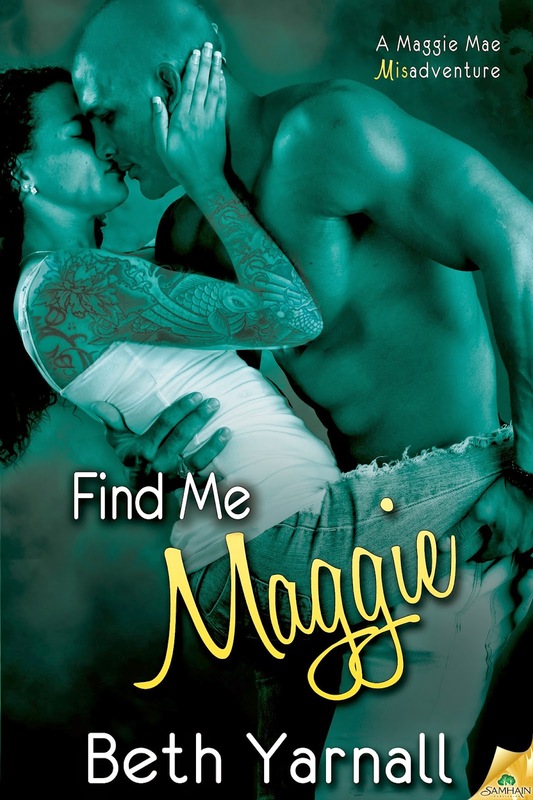 Beth: I had the cover artist add tattoos on your arms, chest and back to reflect the tattoos my character Maggie has. What were the most surprising changes made to your photo on a book cover? Angelina: The most surprising changes on the cover we're definitely the tattoos! I'm such a sissy and won't get a real one. I was super excited to see that I was given them for your series! Beth: How can readers learn more about your work as a model? And show some love to thereedfiles.com for her awesome photography skills! My thanks to Angelina for taking the time to answer my questions and for bringing Maggie to life on my covers. You’re awesome! It takes a team to create great book covers. I’d also like to thank Jorge Mojica for being the perfect Clive. I’m also grateful for the immense talent and skill of photographer, Taria Reed, and cover designer, Angela Waters. Wake Up Maggie is out now. 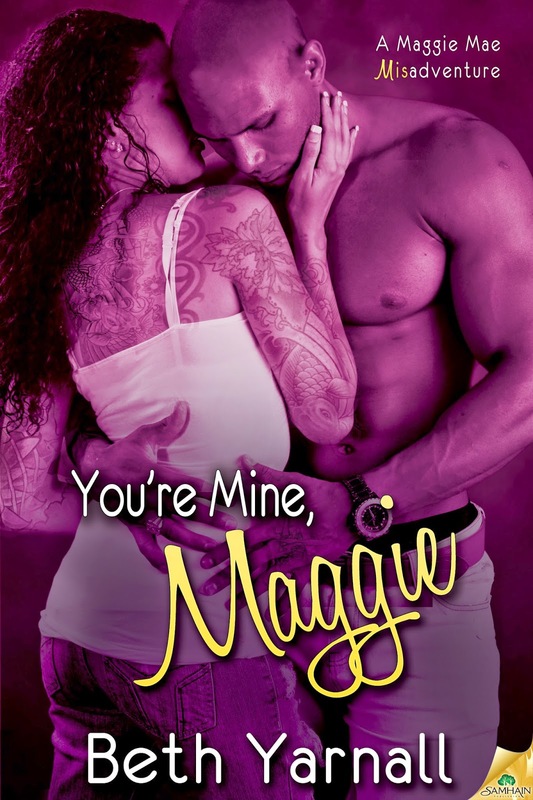 You’re Mine, Maggie releases today, April 15th. Find Me Maggie releases July 8th. Which of the three Misadventures of Maggie Mae covers is your favorite? I must say youre a new author for me but I'm looking forward to checking out your books!! This seems like a great series! Loved the interview with the cover model too! I love the stories and a chat with one of the cover models was a fun addition.